What was good about 2016? Art, art & art: exceptional art shows! During the traditional “feel good” New Year’s Concert in Vienna on the first day of the year, I want to remember what inspired me in 2016, rather than what depressed me. Without a doubt three exceptional art shows (amongst many more) spring to mind! First, the Hieronymus Bosch show in the painter’s hometown of ‘s Hertogenbosch in Holland. Every Bosch painting demands hours of attention, an impossible task at a very busy show, and it is nearly impossible to fathom how a man living in a provincial town in Holland in the late 15th century could have had such fantastical and unparalleled visions of, well: everything! Second, the Klimt and the Women of Vienna’s Golden Age, 1900–1918 show in my favorite New York museum: the Neue Galerie! These near life size portraits, shown close to the “Woman in Gold” portrait of Adele Bloch-Bauer were phenomenal. Amongst them, an earlier portrait of Adele Bloch-Bauer, the only woman he painted twice. Thirdly, the Sir Lawrence (Laurens) Alma-Tadema show in the picturesque capital of Friesland: Leeuwarden, in Holland. Proud to be of Friesian descent, it was a joy to drive with my mother over the longest dyke in Holland in a magical wintery landscape to the Fries Museum. Why is the show there? Well, Alma-Tadema was born in 1836 in Friesland, that quaint province of Holland famous for the oldest Planetarium in the world (in Franeker), friesian cows, the 11-town skating race (weather permits) and courageous resistance during WWII! This show is phenomenal and will go on to Vienna and London, the town where Alma-Tadema became one of the most celebrated painters of the late nineteenth century. His historical and orientalist paintings were highly appreciated and fetched enormous prices. What makes his painting enduring is their historical accuracy and evocative atmosphere of life in ancient times. Every detail of hair styles, robes, furniture, objects and architecture was historically accurate, to a point that Alma-Tadema’s paintings were templates for the set and wardrobe designs of most famous Hollywood peplum movies! In the show you see scenes from these films projected above the paintings that inspired the art directors of the films the Ten Commandments, the Last Days of Pompei, Quo Vadis, Exodus and Gladiator! It turns out that the young Gustav Klimt was very inspired by Alma-Tadema’s paintings! Much will be written about the year 2016, with all it’s momentous twists and turns, but luckily (judging by the huge crowds) ART is still the universal language of the human race! 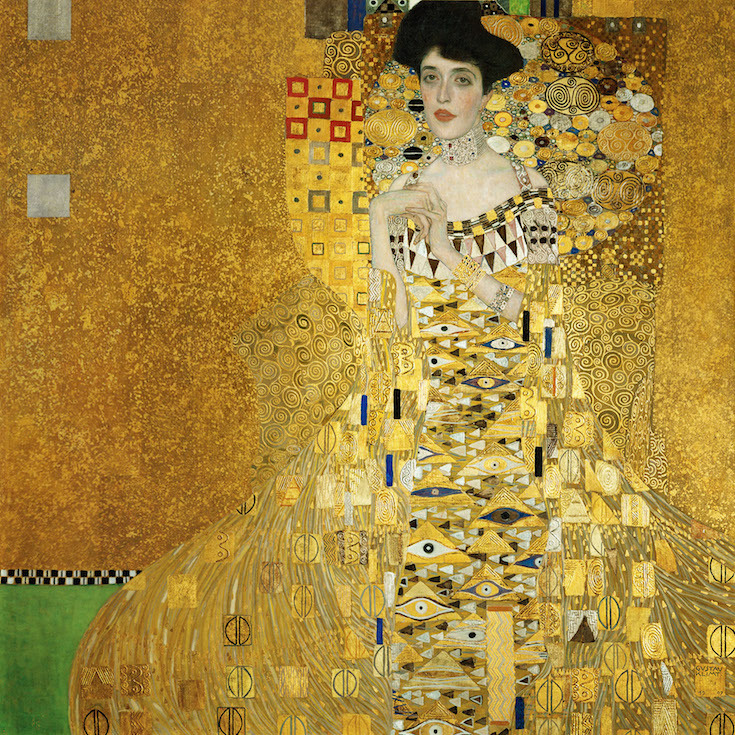 The story of the painting “Woman in Gold” symbolizes the systemic denial, dishonesty and downright criminal attitudes that still reign in Europe and America about the subject of looted art during the Nazi period.